Tonight I made a quiche that was packed, possibly over packed, with spinach and mushrooms. 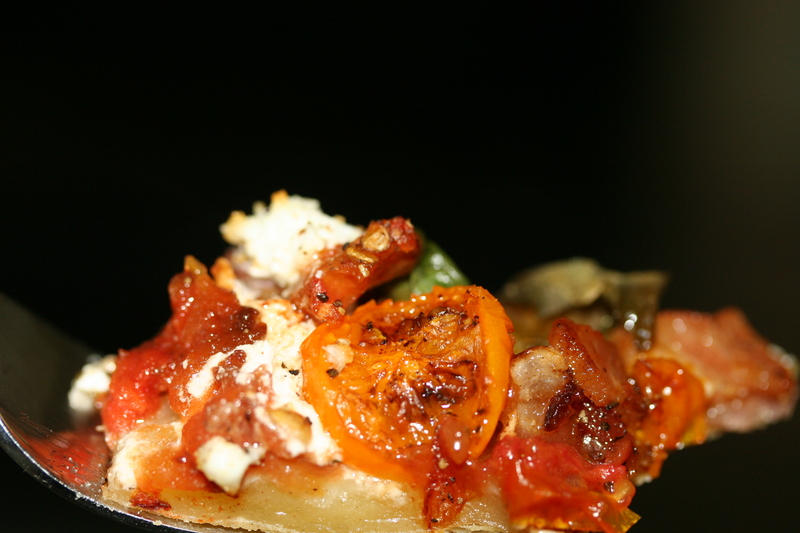 Since we like goat cheese, I broke up large chunks and scattered them on the crust before pouring the egg mixture in. 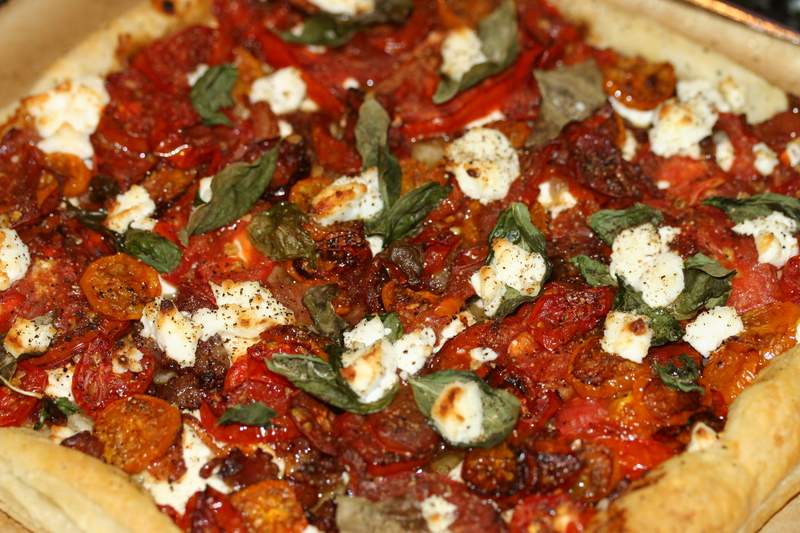 To get some color on the top I went with Parmesan cheese because I didn’t think it would compete with the goat cheese. We enjoyed it for dinner but certainly great for breakfast or brunch. Also holds up well throughout the week. This savory quiche is packed with veggies all suspended in an omelet like egg pie with bursts of tangy goat cheese countered by the slightly sweet crust. 1. Take your pie crust and use a fork to poke the crust so it won’t rise in the oven. You can also put beans or a pan on top of it to accomplish the same thing. Cook it according to the directions on the pie crust. Set aside and let it cool. 2. While the pie crust is baking, Take a saute pan and cook your spinach and mushrooms until they are tender. try to remove as must moisture as possible by squeezing it in a paper towel. Set this aside. 3. In a separate dish crack your eggs and milk and whisk it completely. To assemble your quiche break up the goat cheese and scatter it on the bottom. Next mix your spinach/mushrooms with the egg mixture and pour into the pie sheel. Mine was pretty packed. You may have extra. 4. 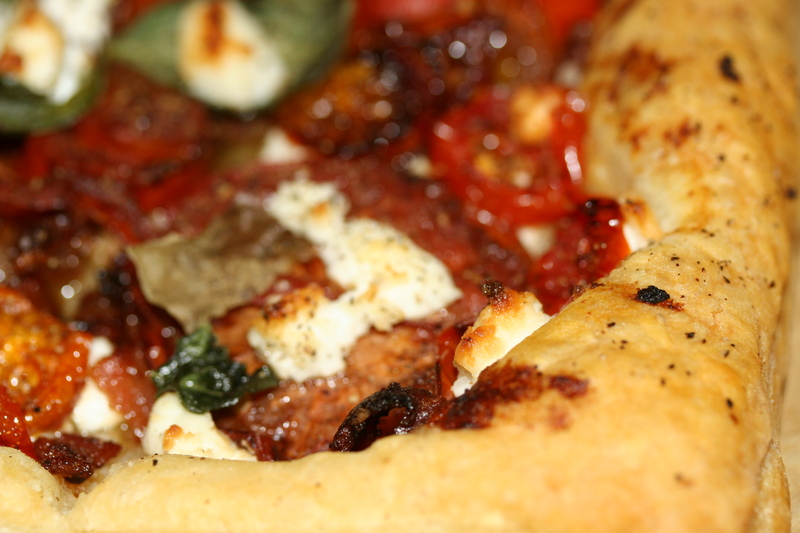 Now protect your crust by wrapping foil around it so that it doesn’t over cook in the oven. Remember the pie crust is already cooked so you want to protect it. Top with Parmesan cheese to cover. Put in a 350 degree oven and cook for about 30-45 minutes. Just check it at the 30 minute mark and watch it until the eggs are solid and not giggly. 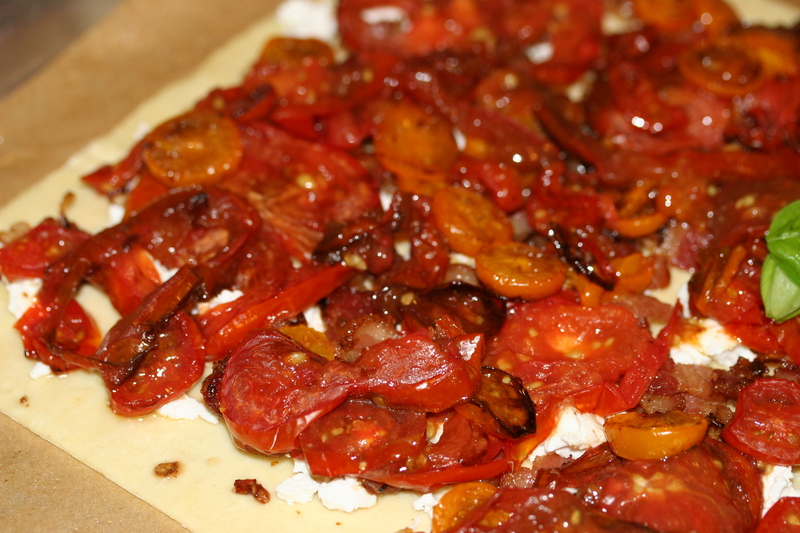 This summer I have been loving tomatoes so I went to store thinking I was going to make a roasted tomato pasta with pancetta, basil and goat cheese. 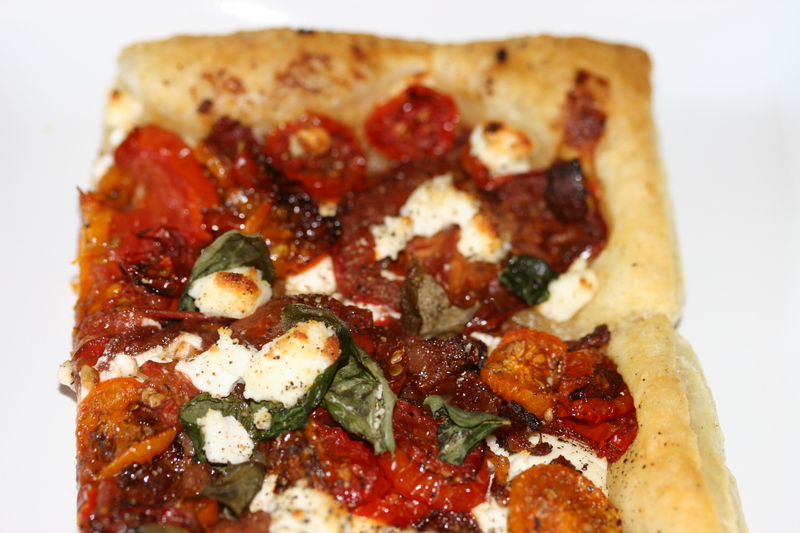 I just love that combo of the tangy goat cheese, sweet tomatoes and salty crunchy bacon/pancetta. I have been working this combo on sandwiches, salads and pastas all summer. So at the grocery store the pancetta just looked too fatty so I opted for bacon and trimmed it up a bit. When picking up some frozen fruit, I spotted the puff pastry and thought I would turn the meal in to a tart instead of pasta. 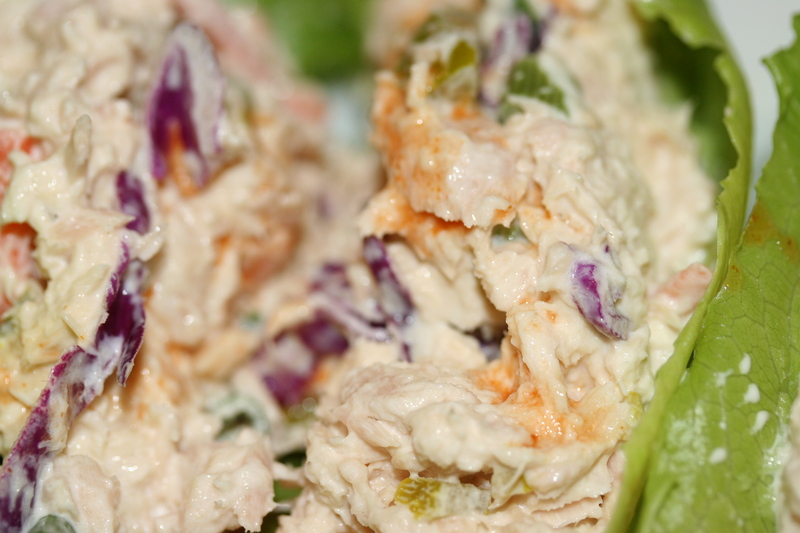 It turned out amazing and it has so many other possibilities You could cut them into appetizer portions which would be great for a party or finger food. You could make them into pockets or hand pies and obviously change up the ingredients. But why would you consider such insanity? Try it this week. You will not be disappointed. 1. 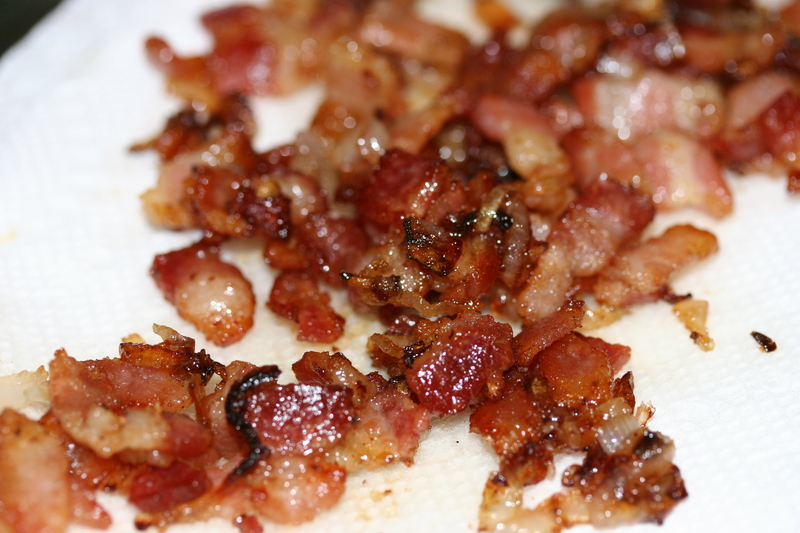 In a medium low heated cast iron skillet add your trimmed and diced bacon and the shallot. Cook this low and slow until the bacon is crispy. Right before you remove it add your minced garlic and brown sugar and turn off the heat and let it cook for a minute or two, stirring constantly. Remove and set aside on a paper towel. 2. While your bacon is slow cooking. Preheat your oven to 350-400 degrees. Slice your tomatoes and pat them dry. Sprinkle and drizzle salt, olive oil and balsalmic vinegar and roast them for about 20 minutes. Set them aside and pat some of the juice off of them. This will turn into a jam like mixture but you don’t want it too wet because the pastry will be too soft. 3. After your puff pastry has thawed for 20 minutes or so start the assembly process. I brushed some of the bacon fat on the edges of the pastry. 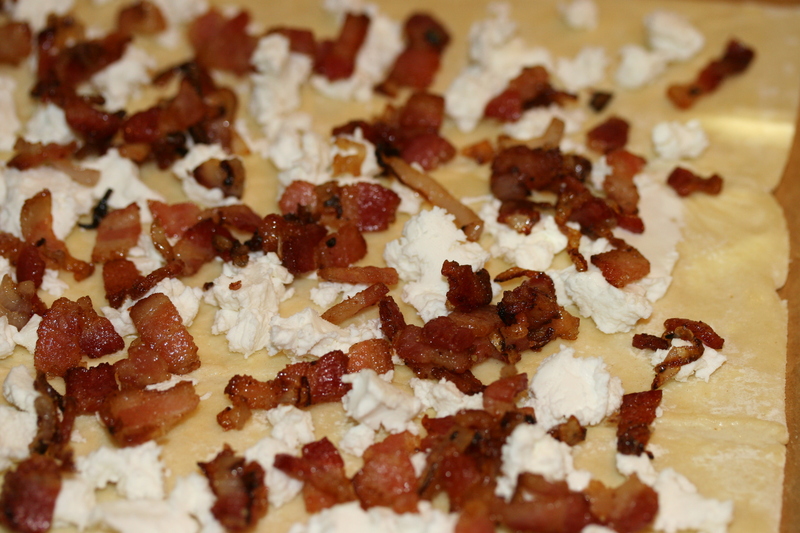 Then I crumbled the goat cheese and spread the bacon mixture. 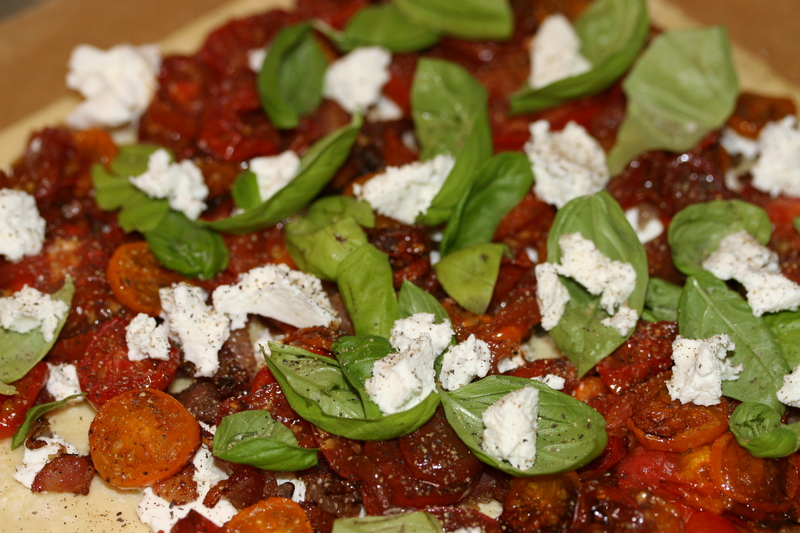 Now add your tomato “jam” evenly and then top with some more goat cheese that you might have left, basil and sprinkle some salt and pepper. 4. Bake for about 13 minutes or until the pastry is done. 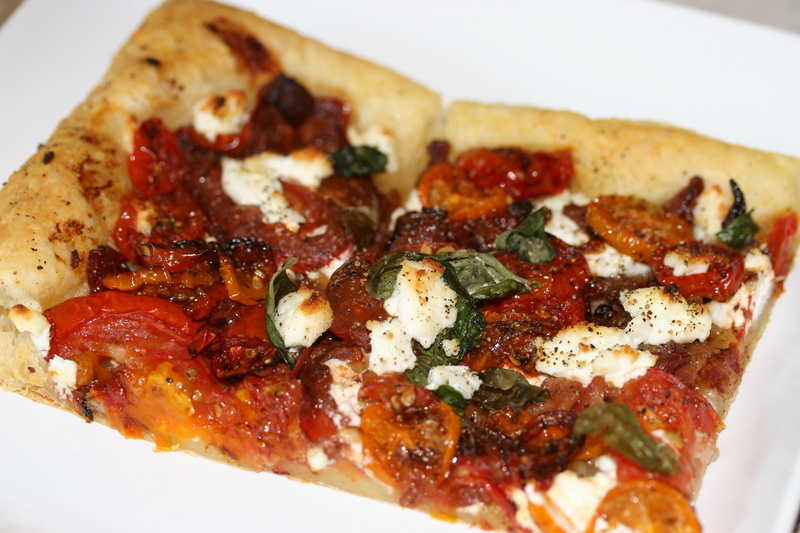 Slice, eat and enjoy. I first found the base of the recipe from the cookbook “Guy Gourmet”. It’s a really great cookbook for the fellas. It’s based upon the Men’s Health magazine coverage of one of kind foods, cooking and nutrition. Adoma Steinmen and Paul Kita are the two that put it together with the editors of Men’s Health. The 150 healthy recipes are from various star chefs like Rick Bayless, Thomas Keller, Tyler Florence and Morimoto to name a few. Valentines day gift for your dude chefs perhaps? 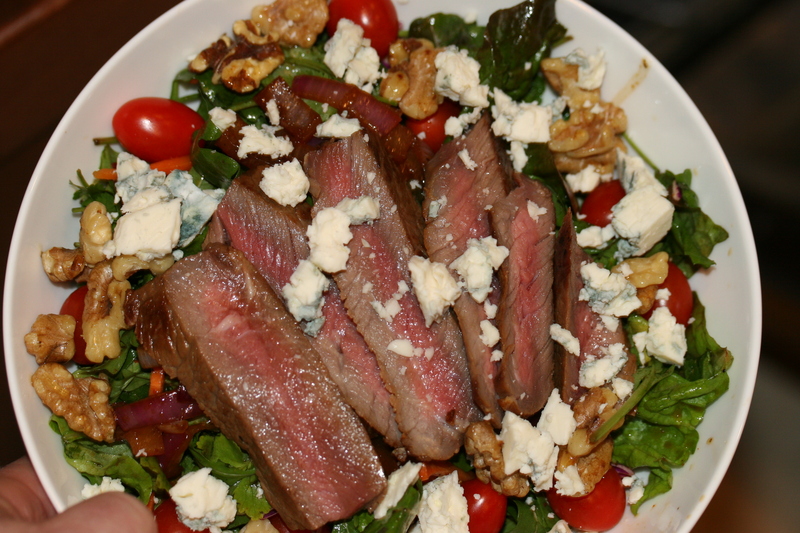 This Asian steak salad recipe has a wonderful flavorful from the simple dressing. The freshness of the lime paired with the saltiness of the soy and the pop of heat and sweet from the Sriracha and honey is a harmonious flavor bomb. It’s just great. You can use what ever veggies wet your whistle. I omitted cucumber and avocado simply because I didn’t have them on hand. 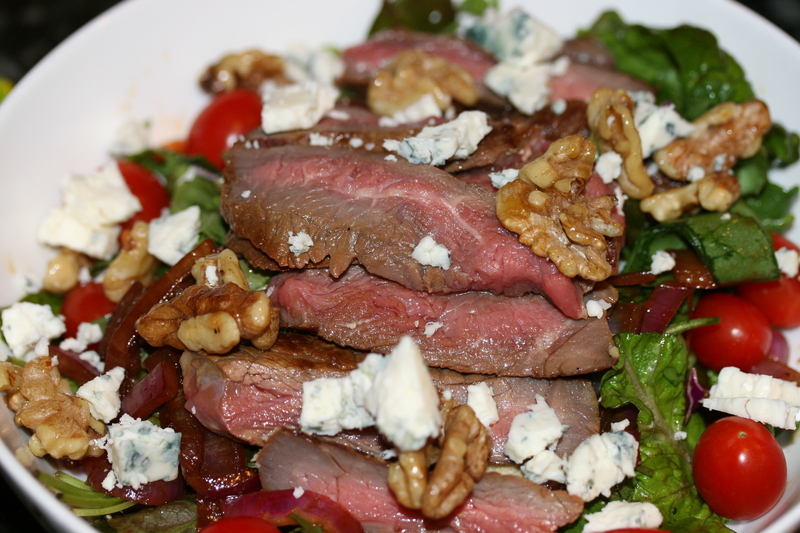 The steak is a great choice over the typical chicken used in most salads. Cooking the steak medium rare gives you a buttery and tender bite that just works splendidly with the salad dressing. I added blue cheese because I think it works so well with steak despite the Asian flavors of soy and Sriracha. Goat cheese would also be nice. At the end of the day, the dressing is the star of this show so you can alter the supporting cast to your tastes and preferences. 1. 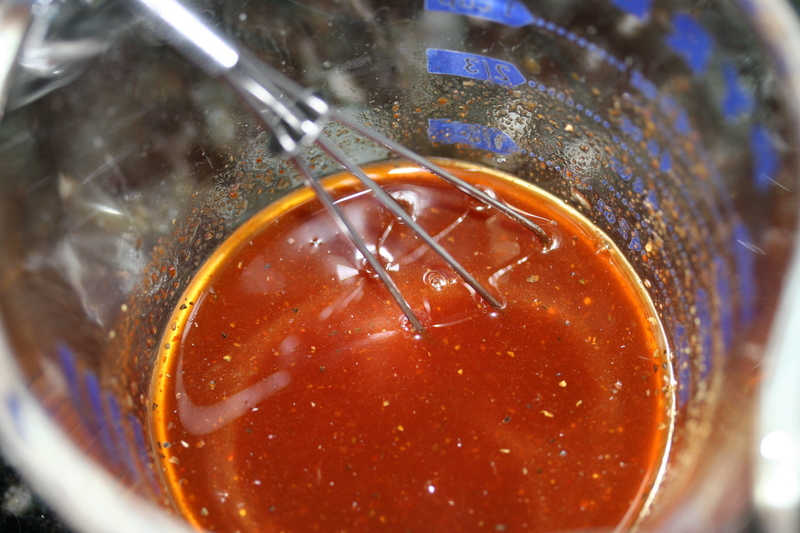 Mix your dressing by juicing a lime and adding Sriracha, Honey and Soy and whisk until combined. Set aside. 2. 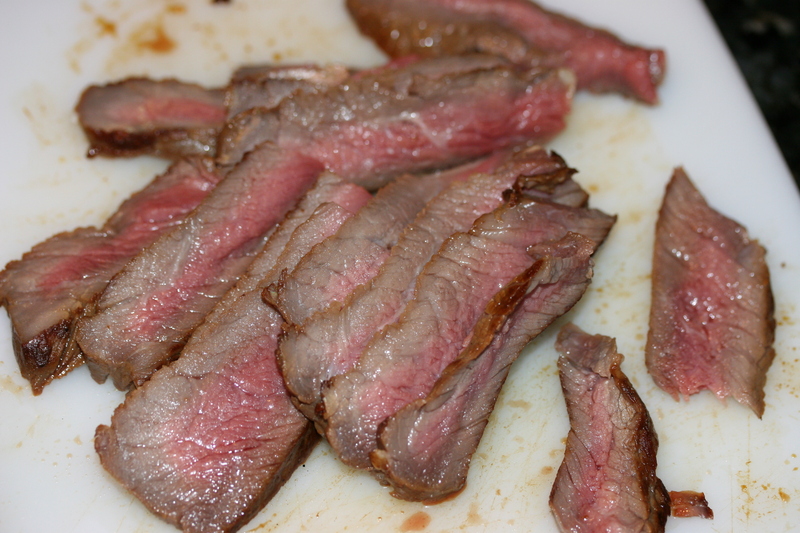 Marinate your steak with a a few glugs of soy and some oil. About 30 mins to 4 hours. 3. Cut all your veggies and combine in a big bowl with the lettuce. 4. 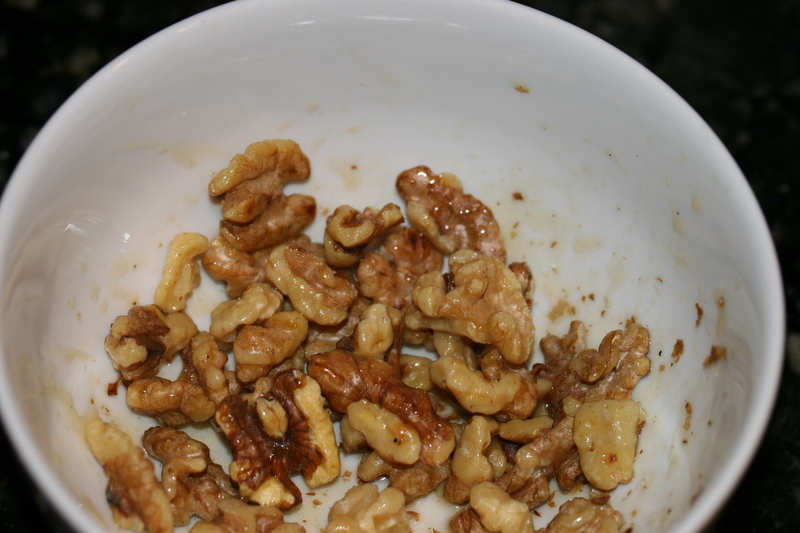 In medium heated cast iron skillet add your walnuts and toast them up. Once toasted pour those hot nuts in a bowl with honey. Mix it around to coat. The heat will loosen up the honey and coat it nicely. Set aside. 5. Return the cast iron skillet back to the heat and let it sit for a few minutes. Add some grapeseed oil and then sear your steak. Cook on each side for about 4-5 minutes until a nice crust develops. I like this meat medium rare to medium. 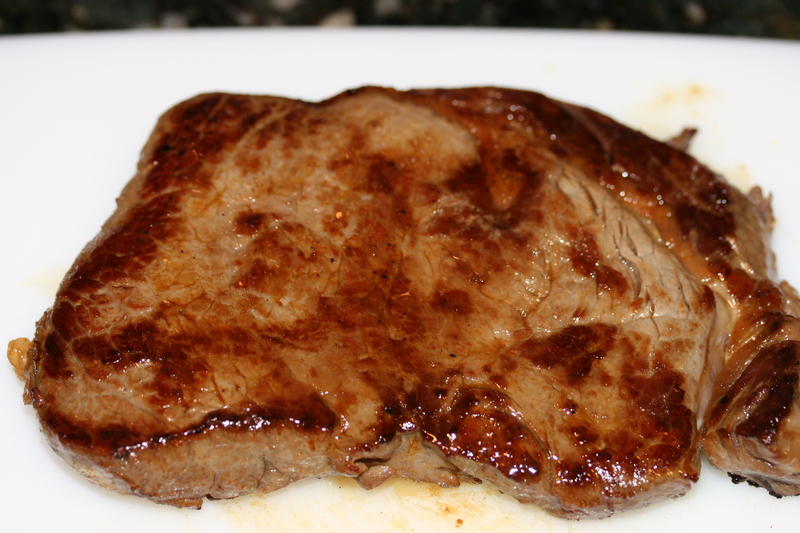 Set your steak on a cutting board and let it rest for 7-10 minutes. Slice thinly on the bias. 6. Lower the heat to medium low. 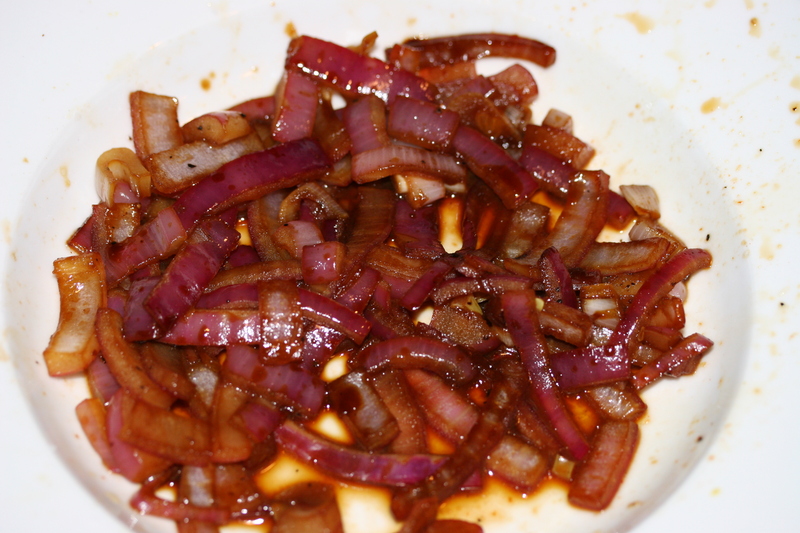 Dice your red onions and put them in a bowl with some rice vinegar and a glug of soy. In the same pan add the diced red onions and soften them just a bit. This will take some of the bite out of the onion. Remove from the heat and pour in a bowl to cool. Today for lunch I was wanting something simple, flavorful and low carb. I had an avocado and some romaine on hand but they were on the back end of their freshness. Whipped up these little tuna boats and topped with a tiny bit of Sriracha chips for some crunch. 1. Pretty simple… Press the water from your cans of tuna. 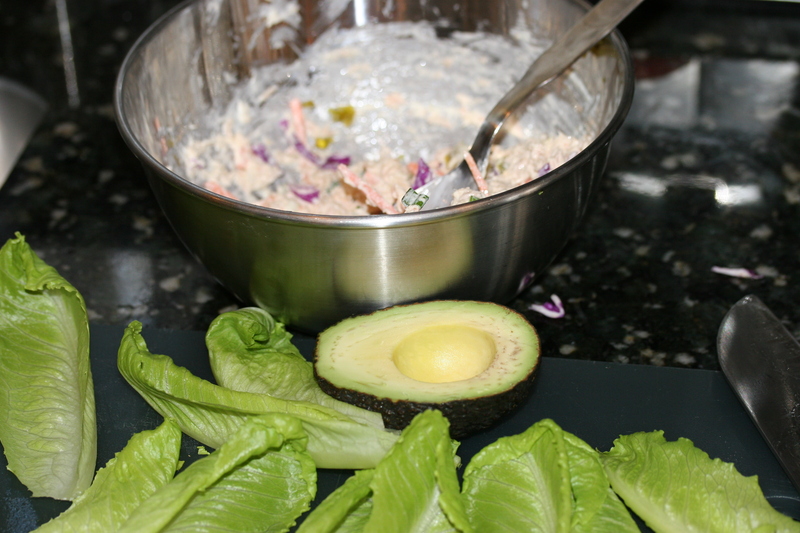 Put in a bowl and mix it in with Duke Mayo (use the amount you like in your tuna salad). 2. 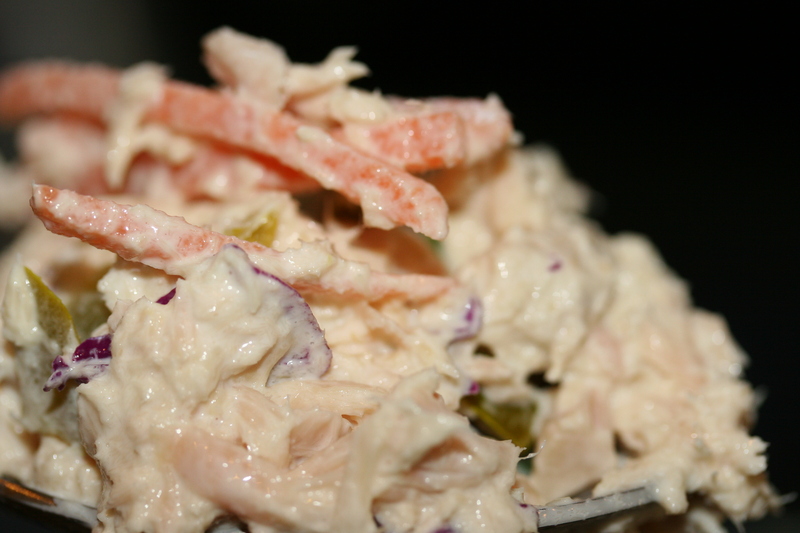 Mix in the shredded / diced carrots, jalapenos, purple cabbage. Kosher Salt and Pepper… taste and adjust accordingly. 3. Slice your avocado and cut the bottom of your Romaine lettuce. 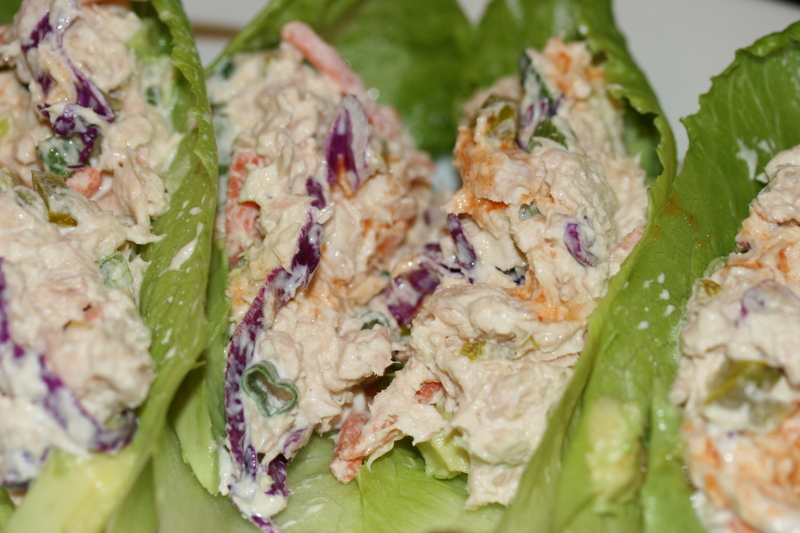 Put some avocado in the base of your lettuce leafs. 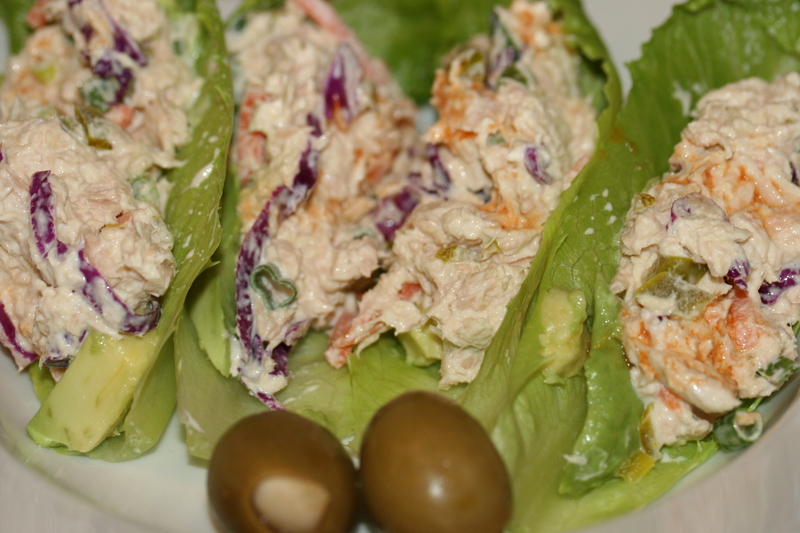 Top with your Tuna Salad. 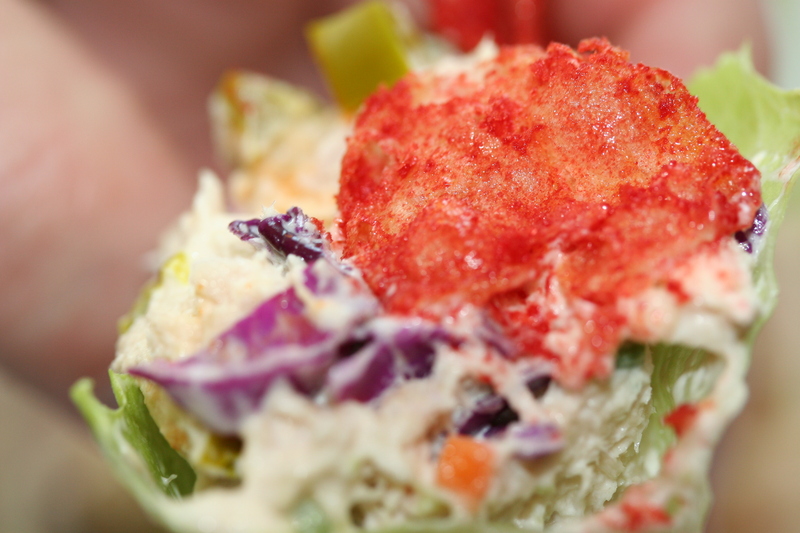 I hit each boat with 2-3 glugs of Tabasco sauce and then topped with some crumbled Sriracha Chips for color and crunch.